Most problems in our lives stem from lack of confidence, insecurity, and fears. These trace back to something fundamental about our identity: we don’t truly know who we are … and whose we are. Society makes it hard to figure that out because it defines success and identity by performance, popularity, and prosperity. The making of a champion is about more than that. People worldwide obsess over pro sports (in the U.S. we pour $30 billion into four major sports!). The idolization and focus on pro athletes is intense. Imagine how easy it is for these athletes to wrap themselves in that identity — an identity which is volatile and will end quickly. As a pro athlete, I went through that identity-shaking transition. It’s hard. I’ve seen a lot of NFL players deeply struggle with identity, but that struggle isn’t confined only to athletes. Outside sports, teenagers struggle, women struggle, men struggle. That solution struggle for true identity is captured in a video recently forwarded to me by my son, Kory. 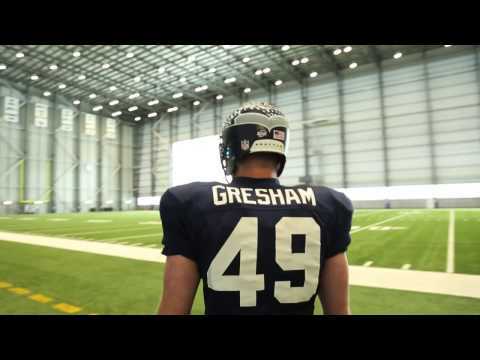 In the video, several players and coaches from the Seattle Seahawks use their pro football platform to point others to the only ultimate solution in life for true identity — the great news of God’s love for us through Jesus. It is so cool to see these NFL guys realize that who they are is really defined by who God sees them to be. They explain from personal experience that there’s a bigger and better confidence than one based on success and circumstances … even when you’re living your dream as an NFL player. This is a great video to share with sons or daughters about how to be a champion in life, in the deepest sense. You can share it with a buddy who loves football, but who doesn’t yet understand the love of God. Star quarterback Russell Wilson and others in the video talk football, and they talk life. They share that their identity and satisfaction doesn’t come from their accomplishments, but from their relationship with Christ. It comes from knowing Him, surrendering to Him, and knowing the truth about who He makes us to be. Grasping our true identity is a key to facing life. So, enjoy and share an inside look into the spiritual core of some children of God … who happen to play football in the NFL. Jeff Kemp quarterbacked for eleven seasons in the NFL, and with the Seahawks from 1987-1991.